New technology to help people who have difficulty using voice telephones is being trialled by police in Avon and Somerset. The system brings together voice, video and text simultaneously in phone calls. 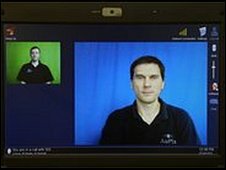 A video-relay service is also planned so that deaf and the hearing-impaired can communicate via sign language interpreters. Avon Fire and Rescue Service is also supporting the project, which is partly funded by the European Commission. Chief Inspector John Hart said: "People need to be able to contact the police easily, either in an emergency or to contact their neighbourhood Pc." He said the project could bring "a real benefit to the community we serve". "We do have things in place to provide an alternative to voice phones for people to contact us. "However this instant video communication system won't require an appointment and will be quicker and more responsive than texting." Professor Jim Kyle, from the University of Bristol's Centre for Deaf Studies, one of the project's partners, said: "Users will be able to see each other when they call, will be able to use relay services and will also be able to reach 999 services directly."